At 9×14 cm it’s just the right size, with 192 pages. Made in Italy (like all great notebooks), with the trademark oilcloth-bound cover, acid-free pages, expanding pocket in the back, elastic band for securing the notebook and ribbon placeholder . . . well, anyone who knows the Moleskine stuff knows what I’m talking about. 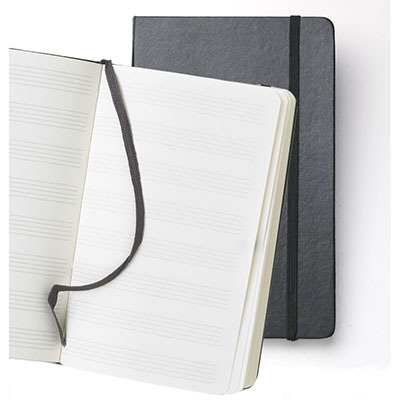 Now great musicians can join the ranks of Matisse, Hemingway, and other famous Moleskine customers. Lest you think I’m marketing for the Moleskine people, the notebook is sadly out-of-stock — bet they didn’t realizing how many budding Beethovens would snap this up. A notification list is available for when they’re shipping again.